The unemployment rate fell from 10.0 to 9.7 percent in January, and nonfarm payroll employment was essentially unchanged (-20,000), the U.S. Bureau of Labor Statistics reported today. Employment fell in construction and in transportation and warehousing, while temporary help services and retail trade added jobs. Nonfarm payrolls decreased by 20,000 in January. 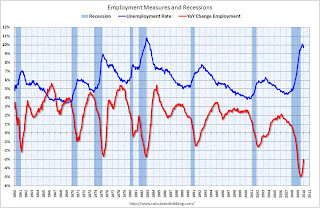 The economy has lost almost 4.0 million jobs over the last year, and 8.42 million jobs since the beginning of the current employment recession. 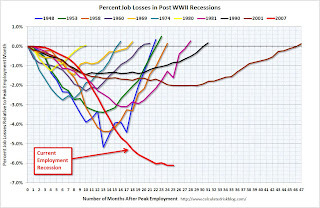 (note: job losses were 7.2 million before benchmark revision).